College students will be able to get the NFL Sunday Ticket over the Internet without DirecTV or a satellite hookup this fall in their dorms or college housing. 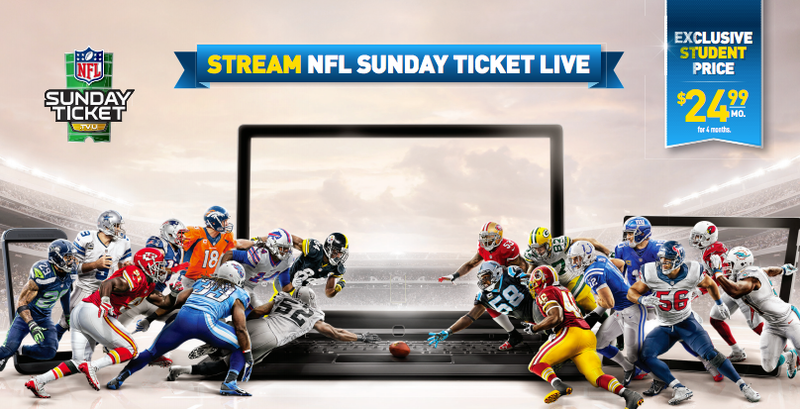 NFLSundayTicket.tv will be available on a variety of mobile, tablet, and tv connected devices, as well as via the computer browser. DirecTV made a similar offer last season, but limited it to only 10 universities at a price of $149. This year, it’s open to all 4 year colleges at a reduced price of $99. It does appear to be limited to 4-year colleges and universities. So, if you are attending a 2-year community college you’ll probably find yourself out of luck.